Now, a journalist, bouncing off the sky ? I am glad to see that NG is reaching out to teachers. I know most technology based companies are very concerned about the state of US science education. I look forward to that post. If I had a spare $5000 just lying about, it would indeed be tempting to go for a spin. 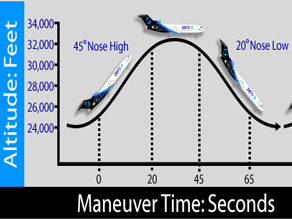 But as a pilot myself, I have experienced this phenomenon on a much smaller scale in the KC-135R and C-21A. Fun ride but poor story. Is it any wonder that we lag behind in the math and sciences in this country when even our science writers fail to understand, or at least convey, the true nature of the phenomena that they are describing. At no time were you weightless or in a zero-g environment. You are simply in freefall in the earth’s gravity field and experience apparent weightlessness. The same goes for any astronaut orbiting earth but it is never described as such. Readers and students alike have no chance of understanding the fundamental physical laws behind the “story” when only a portion of the facts are presented. The sky is falling and hit the Reporter ? The sky is still; Reporter hit the sky. Lamp post hit you car? You can relatively set your watch by that. "I was producing a story on how Northrop Grumman is chartering a specially-modified jet to take teachers on zero-gravity plane rides. The idea is to have math and science middle-school teachers conduct experiments during a once-in-a-lifetime weightless flight, and have them take that thrilling experience back to their students, inspiring and motivating a new crop of scientists, astronauts, and engineers." What a waste of resources. A one-time ride on a special airplane is not going to inspire any students. They'll hear the story once or twice, think "cool," and then go back to whatever they were already doing. The only recipe for sustained growth in science and engineering is a crop of good jobs, plain and simple. It's a pretty straightforward correlation between (perceived) availability of jobs and the number of people who decide it's worth their time to study science in a sustained way. An inspiring teacher is only going to affect a student or two at most. 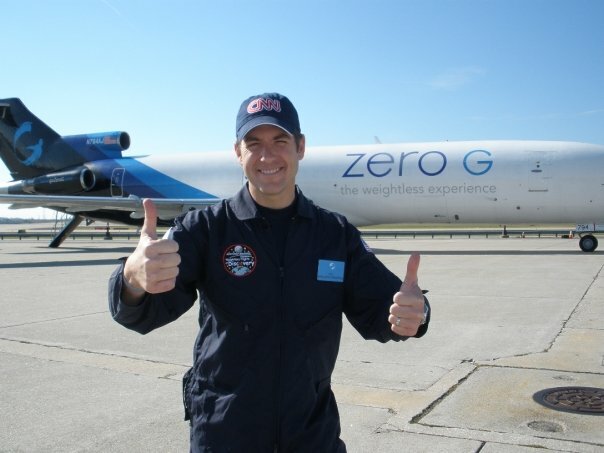 You could fly science teachers in "zero G" all day long for the next century and still not make a dent. Sci Dude, correct me if I'm wrong, but I thought that job prospects are currently quite good for science and engineering students. Scienceguy, you're no Bill Nye! Weightlessness is a proper term for freefall, whether experienced in an airplane, earth-orbiting spacecraft, or while skydiving. And while NASA likes to use the term microgravity for the environment within the space station, they are still guilty of misapplying physics terminology by saying that an astronaut experiences 2 to 3 Gs when the shuttle decelerates during its descent to earth. And yet despite they're apparent ignorance, they're still capable of navigating robotic spacecraft the solar system. "weightless or in a zero-g environment"
Weight is a force, measure by the bathroom scale. You weigh less on a scale, at the equator, but you have same mass. Diane, please provide us an update when the story is about to be aired. Thanks! Franko, funny enough I happen to work in robotics at NASA. And also funny enough you are not weightless in freefall whether or not it is accepted vernacular. My point was that science writing should tell the true and unambiguous story. Not one that further clouds and issue like "weightlessness" and leads people believe that there are really such things as anti-gravity chambers. You did get two things right...I am no Bill Nye. I did love his simple explinations of complex things and his style of communication. And – NASA does a terrible job of communicating and teaching the general public. I can't say it is really our job, but to stay viable as an agency (read that: to get funding in the future) I think we need to overhaul that aspect of how we operate.
" 1 lb force acting on 1 slug mass will give the mass an acceleration of 1 ft/s2"
You could argue everything has weight, (force), everywhere. Summing al forces, the weight is a measurable differential. Same number of molecules, but bankable is this slug of a profit ? More overwheming still, what weight impanted on US, by the Great Attractor ? Followers of the KingKongSlug are Burma and Liberia. Britain, still traditional, serves beer by the Pint. Smaller cars, mileage by the Pint, can save a lot. 400 degress not 360 ? Reduce shuttle and Mars crashes. Well Yeah in a heart beat !! I would go on this great ride. Knowing that NASA was not going to be knocking on my door anytime soon I took up scuba diving. I knew that would be the closest I could get to zero G. I have always had an intrest in space travel I was at the Cape when Apollo 11 lifted off – Boy Scout troop 100 Ocala, Fla I might add. I have told my friends for years "If Nasa calls and has an open seat I'm there" I hope our space program can continue to make advances in space travel I may get to take that flight afterall. Oh by the way does anyone have the Mega Million numbers for this weeks drawing I sure could use an extra $ 5000.00 or hey might even catch a ride with the Russians " Fly me to the moon "
"Knowing that NASA was not going to be knocking on my door anytime soon "
I am trying to locate the video clip shown on Yahoo Good Morning America on Oct. 22 (on the internet) on our Zero Gravity Flight. It was the clip with you in it and the grey section of the plane. Is there any chance that you could forward that clip to me so I can have it for teaching? It was a great story and featured our experiment about the accelerometer. Journalist are fly with good news. I definitely want to read more on that blog soon. By the way, rather good design you have here, but don’t you think it should be changed once in a few months?